Instead of raising an equity round, a startup might choose to borrow money - and for good reason. Venture debt dilutes founders much less than equity rounds. 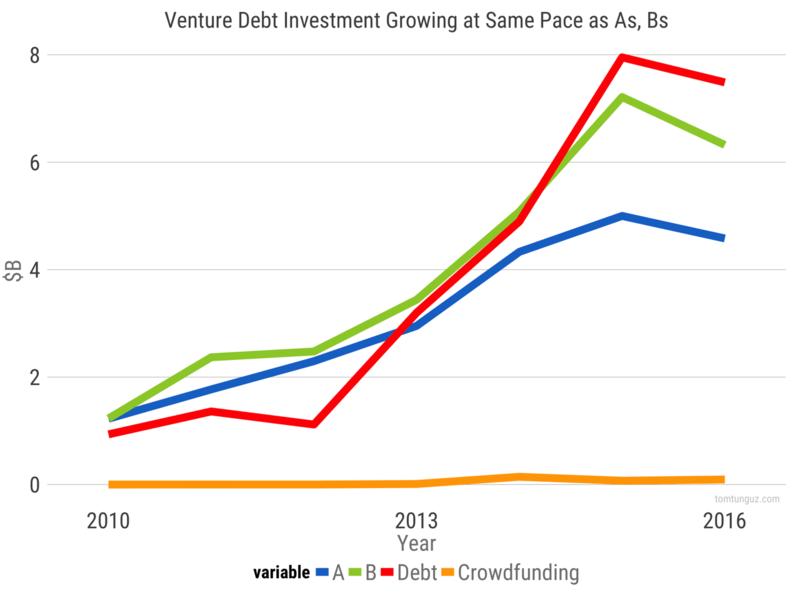 Low interest rates have increased the attractiveness of venture debt, because the cost to borrow is low. Venture debt is an attractive financial product. No wonder it has grown in popularity by 16x in the in the last six years. The chart above shows the amount of venture debt borrowed by US technology startups. 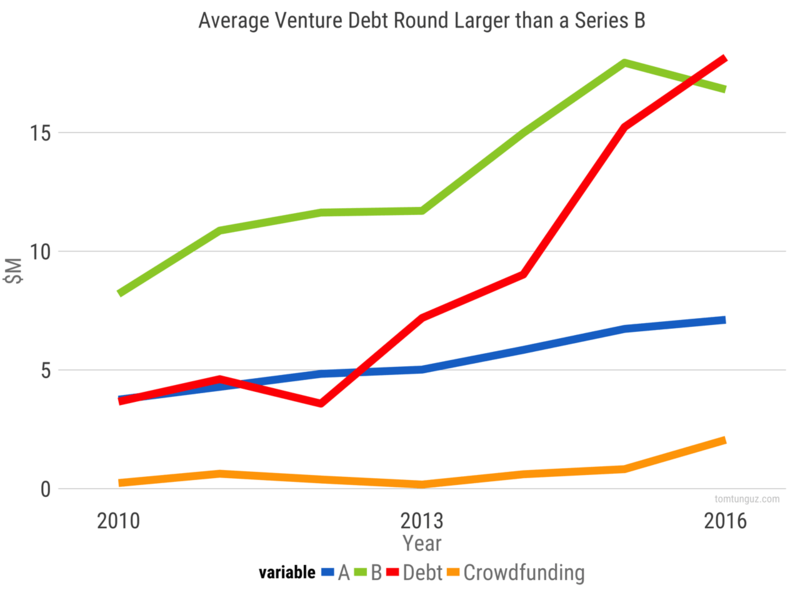 Venture debt volumes have surpassed Series A and Series B dollars. I’ve also included equity crowdfunding, another alternative financing strategy, as a comparison. These venture debt rounds occur with some frequency. More than 500 venture debt rounds closed in 2014 and 2015. 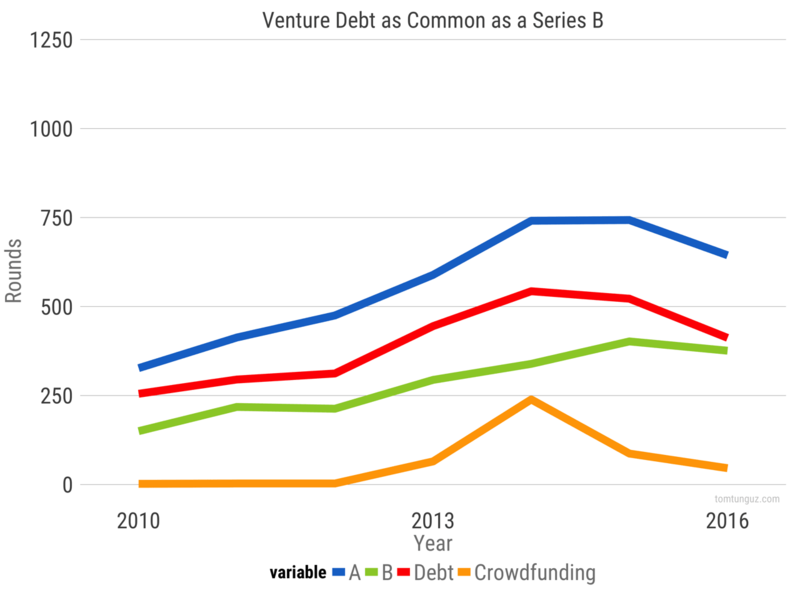 To put it into context, a venture debt round is more common than a Series B. The average venture debt transaction has ballooned from $4M to $18M over this six year period, besting Series B averages. But, there’s a wrinkle. 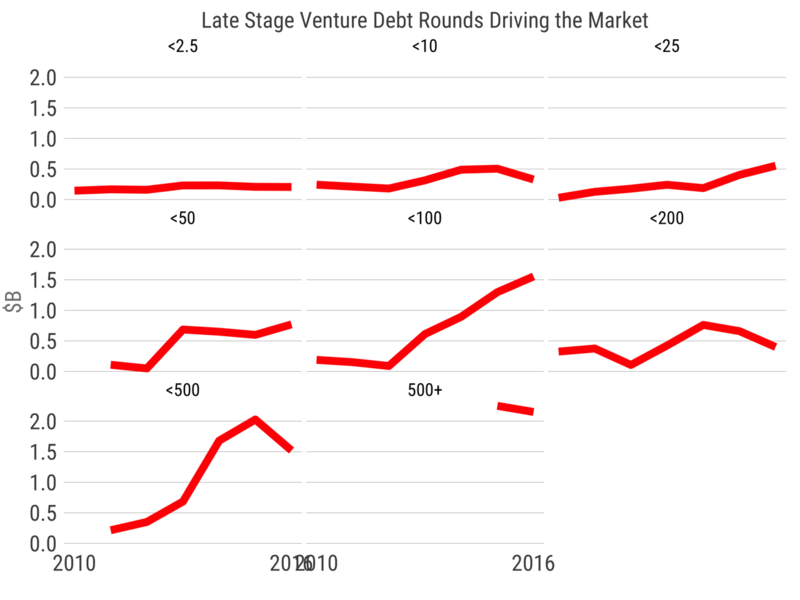 The median venture debt round is a $1M loan over the same time frame - much smaller than a Series A or Series B. The median venture debt round hasn’t changed in size, even though the average has grown by more than 4x. If the typical early stage venture debt deal has remained the same, then where do all these lending dollars flock? Late stage startups. $250-$500M venture debt rounds have grown 6x in the past six years. In 2016, we saw the first $1B venture debt round. Lending at this scale is typically reserved for public companies. But as startups delay IPOs, lenders have provided lines of credit and term loans to these business while they are still private. Venture debt is an attractive way of financing a company’s operations because it’s less expensive and less dilutive than an equity round. As the amount of equity investing in Series As and Bs has exploded, venture borrowing has followed, and a new market has blossomed at the very latest stages.